Is your child showing signs not to be able to manage finances efficiently? However, they may show some signs at young age, which may be a red flag. Here are some such behaviors which your child may show. It is not possible to predict whether or not your children will be able to manage their finances properly in the future. However, they may show some signs at young age, which may be a red flag. Here are some such behaviors which your child may show. Go through this article to know what you should do if you see such behaviors in your child. If you can rectify them at young age, then your children will be better at financial management. If your child often forgets to do his/her school homework on time or they don’t remember to hand over their school papers to you, then it can be a sign that they will not be able to pay the monthly bills on time. Therefore, if your child shows such traits in the formative years, then explain to him/her the importance of doing things on time. You can get your child introduced to marking dates in calendar so that he/she can keep track of his/her important school dates. This way, he/she can get into the habit of doing things on time and will never forget the due payments later on life. If your child loves to watch television commercials and starts asking for a lot of things, then there’s a chance that he/she might grow up to be an impulsive shopper. In order to check this habit, give your child some allowance when you go out shopping and want to buy something for him/her. Allow him/her to buy the first thing he/she asks. Do not stop your child from buying an item even if it is a stupid purchase. Then, continue with your shopping and next time he/she asks for something else, tell him/her that there’s no money left to buy it. This will teach your child to think and decide which he/she really wants to buy. If your little one grows up with this habit, then he/she might make the mistake of buying an expensive thing, such as a car, with a loan, but will face problems to make the loan payments on time. Therefore, to check this habit, keep a track of all the money your child is getting in a year and how he/she is spending it. To do so, keep a track of all the money your child receives as gifts on the occasion of birthday, specific holiday, Christmas or any other event and see how he/she spends it. You can also teach your child the art of saving money. You can tell your children to save all the dollars throughout the year, so that they can plan and make a list of what they want altogether, at the end of the year. You can also help them to make the decision regarding making a relatively expensive purchase with the accumulated money. 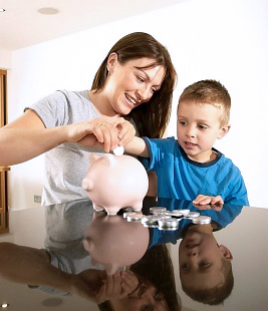 Here are some tips to teach money management strategies to kids at young age. Gift piggy banks – Gift a piggy bank to your child and ask him/her to save the required money in order to a buy an item of his/her choice. Guide them in planning a budget – You allocate some money to your children and ask them to manage their expenses with that. This way, they will know how to budget properly. Give your child opportunity to earn – Involve your little ones in regular household work and give them dollars if they are able to do it properly. By this, your children will know the importance of money. Most importantly, be a role model to your child. Involve all your family members while planning a weekly or monthly budget and allow your children to give their opinion, too. Always pay your bills on time and share this information with your children so that they learn the importance of doing that. Doing so, your children will grow up learning good money management strategies and will be able to manage their finances better in future. Page loaded in 0.150 seconds.